Rescue plans for Wales Sugar Estate have been floated, even as calls have intensified for government to commission a socio-economic study of the impact of closing that West Bank Demerara operation of the state-owned Guyana Sugar Corporation (Guysuco). Speaking at a panel discussion Friday night on the topic “”The Closure of Wales Estate: Are there alternatives?”, former Guysuco Chairman, Vic Oudit said government should lease the Wales Sugar Factory and Estate lands for GYD$1.00 per year to an investor renewable for 25 years. As part of the proposal, he said major shareholders- cane farmers, workers and unions- could establish Wales Sugar Estate Inc by investing GYD$5 billion from in one million shares. “I think this is an opportunity for the people of Guyana to rally up and say ‘we want Wales, we want to form a public company’ and take over Wales,” he said to applause by attendees at the public forum held at Moray House, Camp and Quamina Streets, Georgetown. Wales Estate employs 1,800 persons- 150 factory, 300 administration, supervisory & security and 1,350 agriculture workers. An estimated GYD$300 million have been spent on tilling and planting 830 hectares in 2014-2015. Other equity investors, he said, could include banks, pension schemes who could together buy a US$4 million mini- refinery to make liquid and other specialized sugars instead of bulk sugar which would result in a loss of the GYD$5 billion. “We have to give an undertaking to continue the production of sugar at Wales but we are not going to continue producing sugar the way it is being produced now; we have to look at the value added-aspects of sugar,” he said. Oudit said a ready spin-off from the production of refined sugar is molasses, which could earn additional revenue, or rum- Wales Estate Reserve. The businessman cautioned against the end of all tilling and land preparation because that would adversely impact on the work of future investments. “The question is that time is of the essence and this is where it has come as a complete knock-out blow this announcement that Wales is to be closed,” he said. Instead, he suggested that Guysuco should have told all interested parties to submit proposals to ensure Wales survives while negotiations continue with investors who would eventually take it over. Oudit described as “a lot of rubbish” Guysuco’s argument that the Wales Factory is about 100 years old because, according to him, sugar factories are built to last more than a lifetime with the ongoing replacement of various components. Theorizing that Guysuco’s management has deliberately run down sections of the industry like Wales as an excuse to close them down, Oudit said it would be important for the corporation to keep it as a “going concern” ahead of an lease to investors. He cautioned that other investors who might take over Wales would be merely interested in stripping the estate of its lands and sell them. He said someone should be held responsible for the decline in sugar production at Wales from about 30,000 tons between 2000 and 2004 to about 9,000 tons last year as well as having one person performing tasks of four persons. Chartered Accountant, Christopher Ram addressing the forum. The other idea floated by Chartered Accountant, Christopher Ram entails the establishment of a company or cooperative society and the injection by government of US$2 million in rehabilitating the Wales Sugar Factory. “Having got some kind of stabilization going, this new entity can develop a strategic plan source financiers, decide which technology and what we can do and what we wouldn’t do- that’s the option available,” he said. Guysuco’s former Industrial and Human Resources Manager, Jairam Pitam also supported the continued production of sugar at Wales through privatization to a local consortium of existing farmers and private sector and /or private individuals. “I believe there is a lack of capitalization over the years that has contributed to the present state of the factory,” he added. He attributed the decline in production to poor agricultural management at the estate to deal with rodents and weeds. Guysuco’s former Industrial and Human Resources Director, Jairam Pitam delivering a presentation at the forum. 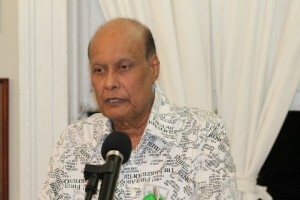 Ram chided government and Guysuco for not only refusing to participate in the panel discussion to defend its decision that would affect the lives of more than 100,000 persons but also failing to communicate and engage with the stakeholders about a decision that was not even recommended by the Commission of Inquiry. “The decision is clearly premature. It is was not properly thought out. It was poorly communicated. It has not looked at the implications either for the communities or the corporation itself,” said Ram, previously known to be a harsh critic of the then People’s Progressive Party Civic (PPPC) administration. He also questioned why government appeared not to have taken seriously the findings and recommendations of the Sugar Industry’s Commission of Inquiry. He observed that authorities ignored the economic rate of return whole focusing only on the financial rate of return. Guysuco Board Member, Anthony Vieria was there in his personal capacity. Minister of Business, Dominic Gaskin was among the attendees but he did not comment although he listened very keenly. 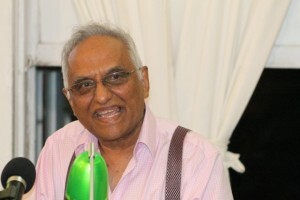 Derrick Venture, a representative of the Private Cane Farmers. 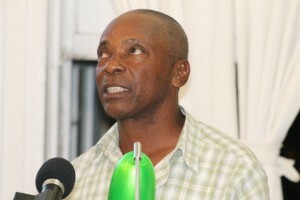 Derick Venture of the La Retraite- Stanleytown Private Cane Farmers Association, who has written to President David Granger about the plight that would face several West Bank Demerara as a result of the closure of the Wales Estate, said farmers could take over that estate while Guysuco retains control of the factory until 2018. He said he has not even received an acknowledgement of his letter to the Guyanese leader. “Our problem there is that taking canes to Uitvlugt would be very, very costly. We will lose sucrose content because of the time it would take to get the canes there and it would be too tedious for farmers to survive,” he said. 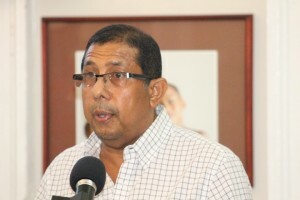 Venture said if the canes have to be transported from Wales to Uitvlugt, there would also be spillage of canes and it would also cost as much as GYD$600 million to put the infrastructure in place to transport the canes to that West Coast Demerara factory. He said the entire plan by Guysuco appeared to have been engineered to force private cane farmers out of business instead of the provision of two years notice. “It’s a case of where you the farmers will have to pull out just like that because you cannot cope with that situation,” he said. The Guysuco’s former Industrial and Human Resources Manager told the session that sending home the 1,500 workers at Wales at an average of GYD$15,000 per week and service of average 15 years would cost GYD$675 million. Like Ram, he expressed concern that government has not conducted a social impact assessment before deciding to close Wales by year-end in light of a lack of jobs in the several surrounding depressed communities. “I believe to really have an accurate and fair assessment on the effect of the closure, a social impact assessment should have been done and that would have been able to determine what would be the consequences to the society and its economic well-being if Wales Estate has to be closed,” he said. He noted that Wales has small rather than medium and large businesses. Pitam said the closure of Wales is expected to hit vendors who ply their trade only on Fridays (pay-day). “They will be displaced,” he said.